Liu, X., & Zhou, J. (2017), “Mind the missing links in China’s urbanizing landscape: The phenomenon of broken intercity trunk roads and its underpinnings”, Landscape and Urban Planning, 165, 64-72. Liu, X., Derudder, B., & Wang, M. (2017). Polycentric urban development in China: A multiscale analysis. Environment and Planning B, org/10.1177/2399808317690155. Tian, Y., Liu, Y., Liu, X., Kong, X., & Liu, G. (2017). Restructuring rural settlements based on subjective well-being (SWB): A case study in Hubei province, central China. Land Use Policy, 63, 255-265. Chen, Y., Liu, X., Li, X., Liu, X., Yao, Y., Hu, G., Xu, X., & Pei, F. (2017). Delineating urban functional areas with building-level social media data: A dynamic time warping (DTW) distance based k-medoids method. Landscape and Urban Planning, 160, 48-60. Liu, X., & Long, Y. (2016). Automated identification and characterization of parcels with OpenStreetMap and points of interest.Environment and Planning B: Planning and Design, 43, 341-360. Liu, X., Derudder, B., & Wu, K. (2016). Measuring polycentric urban development in China: an intercity transportation network perspective. Regional Studies, 50(8), 1302-1315. Long, Y., Liu, X., Zhou, J., & Chai, Y. (2016). Early birds, night owls, and tireless/recurring itinerants: An exploratory analysis of extreme transit behaviors in Beijing, China. Habitat International, 57, 223-232. Liu, X., & Wang, M. (2016). How polycentric is urban China and why? A case study of 318 cities.Landscape and Urban Planning, 151, 10-20. Derudder, B., & Liu, X. (2016). How international is the Annual Meeting of the Association of American Geographers? A social network analysis perspective.Environment and Planning A, 48(2), 309-329. Li, J., Liu, X., Liu, J., & Li, W. (2016). City profile: Taipei.Cities, 55, 1-8. Liu, X., Song, Y., Wu, K., Wang, J., Li, D., & Long, Y. (2015). Understanding urban China with open data.Cities, 47, 53-61. Liu, X., & Wang J. (2015). Featured graphic: The geography of Weibo. Environment and Planning A, 47, 1231–34. Liu, X., Derudder, B., & Liu, Y. (2015). Regional geographies of intercity corporate networks: The use of exponential random graph models to assess regional network‐Papers in Regional Science, 94(1), 109-126. Wu, K., Long, Y., Mao, Q., & Liu, X. (2015). Featured graphic. Mushrooming Jiedaos, growing cities: an alternative perspective on urbanizing China. Environment and Planning A,47(1), 1-2. Liu, X., Derudder, B., Witlox, F., & Hoyler, M. (2014). Cities as networks within networks of cities: The evolution of the city/firm‐duality in the world city network, 2000-2010.Tijdschrift voor economische en sociale geografie,105(4), 465-482. Zhan, F. B., Gong, X., & Liu, X. (2014). Mark on the globe: a quest for scientific bases of geographic information and its international influence. International Journal of Geographical Information Science,28(6), 1233-1245. Liu, X. (2014). Exploring the joint dynamics of intercity internet and corporate networks: a stochastic actor‐based modelling approach.Global Networks,14(2), 167-187. Liu, X., Derudder, B., & Taylor, P. (2014). Mapping the evolution of hierarchical and regional tendencies in the world city network, 2000–2010.Computers, Environment and Urban Systems,43, 51-66. Derudder, B., Liu, X., Kunaka, C., & Roberts, M. (2014). The connectivity of South Asian cities in infrastructure networks.Journal of Maps, 10(1), 47-52. Zhao, M., Wu, K., Liu, X., & Derudder, B. (2014). A novel method to approximate intercity networks and its empirical validation.Acta Geographica Sinica, 69, 169-183. Liu, X., Derudder, B., & García, C. G. (2013). Exploring the co-evolution of the geographies of air transport aviation and corporate networks.Journal of Transport Geography, 30, 26-36. Derudder, B., Taylor, P. J., Hoyler, M., Ni, P., Liu, X., Zhao, M., & Witlox, F. (2013). Measurement and interpretation of connectivity of Chinese cities in world city network, 2010.Chinese Geographical Science, 23(3), 261-273. Liu, X., & Derudder, B. (2013). Analyzing urban networks through the lens of corporate networks: A critical review.Cities, 31, 430-437. Liu, X., Derudder, B., Liu, Y., Witlox, F., & Shen, W. (2013). A stochastic actor-based modelling of the evolution of an intercity corporate network. Environment and Planning A,45(4), 947-966. Liu, Y., Wen, C., & Liu, X. (2013). China’s food security soiled by contamination. Science,339(6126), 1382-1383. Wang, H., He, S., Liu, X., Dai, L., Pan, P., Hong, S., & Zhang, W. (2013). 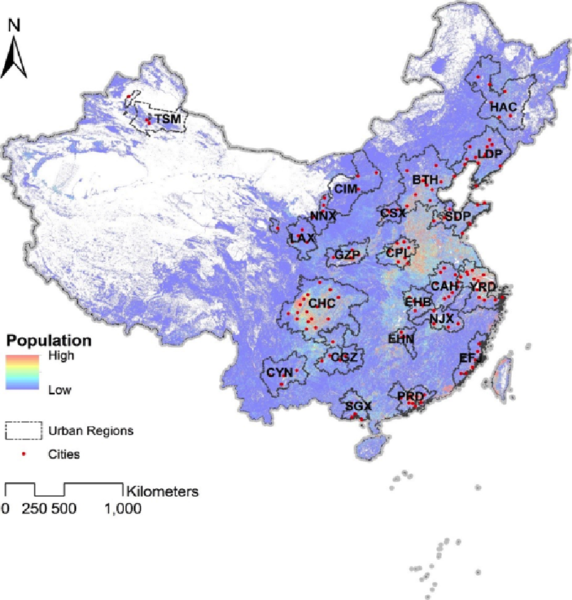 Simulating urban expansion using a cloud-based cellular automata model: A case study of Jiangxia, Wuhan, China.Landscape and Urban Planning, 110, 99-112. Liu, X., Derudder, B., Csomos, G., & Taylor, P. (2013). Mapping shifting hierarchical and regional tendencies in an urban network through alluvial diagrams.Environment and Planning A, 45(5), 1005-1007. Liu, X., & Zhan, F. B. (2012). Productivity of doctoral graduate placement among PhD-granting geography programs in the United States: 1960–2010.The Professional Geographer,64(4), 475-490. Liu, X., Hong, S., & Liu, Y. (2012). A bibliometric analysis of 20 years of globalization research: 1990–2009.Globalizations, 9(2), 195-210. Liu, X., & Derudder, B. (2012). Two‐mode networks and the Interlocking World City Network Model: A reply to Neal.Geographical Analysis, 44(2), 171-173. Liu, X., Neal, Z., & Derudder, B. (2012). City networks in the United States: a comparison of four models.Environment and Planning A, 44(2), 255-256. Wang, H., He, Q., Liu, X., Zhuang, Y., & Hong, S. (2012). Global urbanization research from 1991 to 2009: A systematic research review. Landscape and Urban Planning,104(3), 299-309. LeSage, J., Pace, R. K., Campanella, R., Lam, N., & Liu, X. (2011). Do what the neighbours do.Significance, 8(4), 160-163. Liu, X., & Taylor, P. J. (2011). A robustness assessment of global city network connectivity rankings.Urban geography, 32(8), 1227-1237. LeSage, J. P., Kelley Pace, R., Lam, N., Campanella, R., & Liu, X. (2011). New Orleans business recovery in the aftermath of Hurricane Katrina.Journal of the Royal Statistical Society: Series A,174(4), 1007-1027. Liu, X., Zhang, L., & Hong, S. (2011). Global biodiversity research during 1900–2009: a bibliometric analysis.Biodiversity and Conservation, 20(4), 807-826. Liu, X., Derudder, B., & Liu, Y. (2011). Featured graphic: GDP, livability, population, and income inequality of world cities.Environment and Planning A, 43(10), 2255-2256. Liu, X., Zhan, F. B., & Ai, T. (2010). Road selection based on Voronoi diagrams and “strokes” in map generalization.International Journal of Applied Earth Observation and Geoinformation, 12, S194-S202. Liu, X., & LeSage, J. (2010). Arc_Mat: a Matlab-based spatial data analysis toolbox.Journal of Geographical Systems, 12(1), 69-87.